I attended Dr. Yaron Brook's talk, Woodstock’s Legacy: The Rise of Environmentalism and the Religious Right, last night at the Ford Hall Forum. For a detailed account of the content of the speech, I recommend reading SB's post over at One Reality. Rather than duplicate SB's work, I'll instead give you my overall impressions of the talk including details that really struck a chord. First things first, I have lived in the Boston area for over 13 years, and had never set foot in the Old South Meeting House. What an amazing building. While I later learned that the British gutted the interior and used it to practice jumping up on their horses during the revolution -- precisely because the building was seen as a symbol of liberty -- it didn't diminish the historical significance and gravity of the situation. I thought it fitting that we were listening to one of our nation's leading proponents of a philosophy of reason while sitting in a building where Samuel Adams had once given fiery speeches to angry Bostonians. Dr. Brook spoke for roughly 50 minutes. He recalled the themes of Ayn Rand's 1969 Ford Hall speech that contrasted the brutal emotionalism of Woodstock, represented by Dionysus, and the celebration of reason that was the Apollo 11 launch, fittingly represented by Apollo. He then proceeded to analyze how these themes have morphed in American culture in the past 30 years, pointing to the two new predominant movements that now represent Dionysian emotionalism: Evangelical Christianity and environmentalism. The recent historical roots of environmentalism are easily traced back to the New Left of the 60's, and it doesn't take much to grasp the chain of ideas connecting the hippies to today's greens. What I thought was really interesting was Dr. Brook's identification of the roots of the popularity of Evangelical Christianity. Despite the upwelling of anti-reason culture and thought in the 60's, the overall American sense of life was still tied to the ideas of the founders. Whether the Average Joe -- one who went to church on Sunday as a social outlet, drove a Buick and played baseball -- could defend it or not, his default outlook on life was one rooted in individual rights, reason and freedom. The blatant irrationality and emotionalism of the 60's scared the pants off of him, even if he could only refer to his sense of life (i.e. his own emotions) to understand why. In the backlash, Richard Nixon was elected, and even though Carter came next, he was elected only by swearing on a stack of Bibles that we was a God-fearing centrist. It was at this point, when Average Joe needed to turn to some real foundation for protection against the left, that his once casual, social view of the church changed. When Dr. Brook made this identification, I suddenly thought "A HA! That's where this all came from!" In searching for some defense against the left, Americans turned in droves to a fundamentalist version of Christianity. The Evangelical churches preyed upon the cultural emotionalism of the times and drew the people in. So Dr. Brook made the point that, in turning away from the Dionysian nature of the hippies, they adopted yet another version of Dionysian emotionalism. As both sides evolved, it became the collectivist, environmentalist left vs. the evangelical right. The threat this poses should be obvious. Now, rather than a battle between Reason and Emotion, the two key movements widely seen as "polar opposites" in American culture and politics are simply two sides of the same rotten whim-worshiping coin. While the advocates of reason can still rely on some implicit support from what remains of the American sense of life, making some free market advances here, stopping some intrusive regulation there, reason itself is now being attacked from both sides. It was then that Dr. Brook took one step further, and detailed how the sides are now joining forces, united in the fight to "save the earth." This is a formidable problem, and a dire development. With these two movements unified, attacking reason, science, and individual rights from all sides, bringing about a rebirth of reason in America is going to be an uphill battle. As SB mentioned in his post, the talk ended on a surprisingly positive note, considering the bleak picture that was painted. The positivity wasn't in the form of a baseless optimism, but instead was a call to action. Dr. Brook stated that what is needed now is an Apollo-like mission, but in the realm of philosophy, and he encouraged all thinking people to take on the bad ideas of the day, whether it be letters to the editor, blogging, speaking engagements, or simply standing up and saying "I don't think global warming is a problem, based on the evidence." In a funny exchange in the Q&A section, he said (paraphrasing), "Many people have never heard someone question global warming before. They can't believe it!" Just planting that seed, that someone will stand up and question the "revealed truth" of something like that, can bear fruit later. One other really interesting bit happened near the very end of the Q&A. An older gentleman stood up and said, basically "I've been coming to these talks for 30 years, and I'm saddened to see how few people there are in the hall tonight. What has happened?" It was a valid question, because I remember when the Forum was hosted at Northeastern in the mid-90's and there were many hundreds of people in attendance. Dr. Brook laughed and said "Well, for one thing, I'm not Ayn Rand." The audience laughed, but then he went on. Again, to paraphrase, he said "Think about when she gave her lecture in 1969. She could fill a 1,500 person hall. People would travel across the country for the Ford Hall Forum, because if you wanted to hear an Objectivist speak, that was it. In contrast, look at where we are now. This is my third talk in the Boston area this week, and I'll give two more in the coming days. Universities across the country regularly host Objectivist speakers, and in California we have at least one lecture a month. We're planning a new center in Washington D.C." and he went on and on, describing the many opportunities people now have to hear these ideas. Dr. Brook is on TV many times a month, and is published in Forbes magazine regularly. The key, he said, is that we are laying the foundations for a philosophy of reason and individual rights to be considered as a viable and expected alternative to the widely held ideas of the day. "You won't be able to turn on a news program without those ideas being put forth." By the way, C--excellent write up. I find Dr. Brook's vision and enthusiasm for the future of Objectivism so inspiring. ARI has really accomplished quite a bit in recent years. 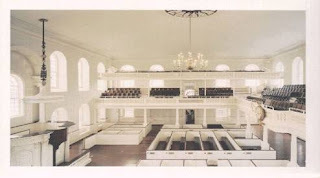 And the Old South Meeting House--how cool! Samuel Adams spoke there, eh? Awesome. Yes, he was able to salvage optimism where I may not have been able to do so. While I can recognize an argument in favor of an optimistic view when presented, I have a difficult time creating those arguments on my own sometimes. With my acerbic tendencies, I find this to be the case in general, though it especially comes to the fore in the realm of parenting. Being a father tests my ability to question my premises with lightning speed, reevaluate my assumptions, and come up with an entirely new, yet valid, optimistic view like nothing I have ever experienced. In all seriousness, nothing in my life has made me a better man than being a father. I'm not completely sure why writing this comment led me to ideas of parenting, except that being "dad" makes me think about fundamentals more often and more consistently than I ever did before. In fact, I think one of the main reasons I began writing this blog is to be worthy of being "dad". I want to both make sure the ideas I hold and teach are sound, and to leave a body of work that can be a resource, and perhaps a source of pride for A. and R.. I know this is only a blog. And yet, I still expened my creative and reasoning energies in order to put down, in writing, the things that occupy my thoughts. If all this amounts to is something I can look back on in ten years as I try to impart some lessons on my nearly grown -- ten years? oh, that's way too soon -- children, so be it. It will have been worth it. This has turned into a major tangent, and one that deserves its own post one day, perhaps. I need to think about it more, though. Back to Jenn's comment, yes, ARI seems to be making the strides we were hoping for 15 years ago. All the more reason to recognize the parallels between the Ford Hall talk and the Tea Tax assemblies of the late 1700's. Overly dramatic? I'll accept that. But in truth, not that far off.